Fishing is a great pastime, but in order for it to be truly enjoyable, you must be safe. Keep these important guidelines and tips in mind for a safe fishing experience. If you are fishing from a boat, be sure to wear a life jacket. Life jackets are also important if you are wading in deep waters that have strong currents. Even if you are an excellent swimmer, a life jacket can help keep you safe in the event that you fall and hit your head. If you are fishing in unknown waters with a strong current, go with a friend. Always carefully check out the area before wading in, and when you do wade in, do so carefully. Take one step at a time to feel for any deep drop-offs that would put you over your head. Bring along a first-aid kit with bandages, antiseptic, pain reliever, anti-inflammatory medication, and a bee-sting kit if you are allergic. Remember, the hooks on the end of your line are very sharp. Before you make a cast, make sure there is no one behind you. And once you catch your fish, never grab it near where it's hooked. 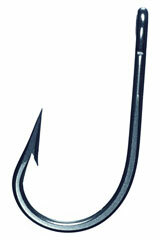 If the fish wiggles the wrong way, the hook could get caught in your hand. To protect yourself from other angler's hooks, wear a baseball hat and sunglasses. These items will also help you see into the water and spot fish, and will protect you from the sun. Always wear sunblock and bug spray, and carry extra in your tackle box. Remember, the more comfortable you are the longer you'll be able to fish. And the longer you can fish, the more fish you'll catch! 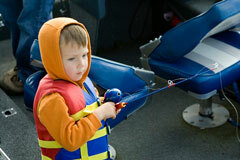 Fishing Safety, published by the Recreational Boating and Fishing Foundation.